This single-owner sale features the unparalleled firearms collection of Mark Aziz, featuring a lifetime's worth of high quality, historically important military and sporting firearms scholarship. The one-day sale will include dozens of scarce and unique examples of revolving firearms development, the flagship lot being the only Artemus Wheeler revolving flintlock rifle available for purchase (Lot 126). This sale also includes an enviable selection of Billinghurst revolving arms, including an over-and-under pill lock rifle/shotgun, winner of an NRA Best Weapons Award in 1962 (Lot 55). Collectors of Colt and Paterson arms will also have the opportunity to bid on four Paterson Revolving Rifles, (Lots 88, 58, 125, and 225), the likes of which have not been seen in at least a decade, nor will be seen again for years to come. 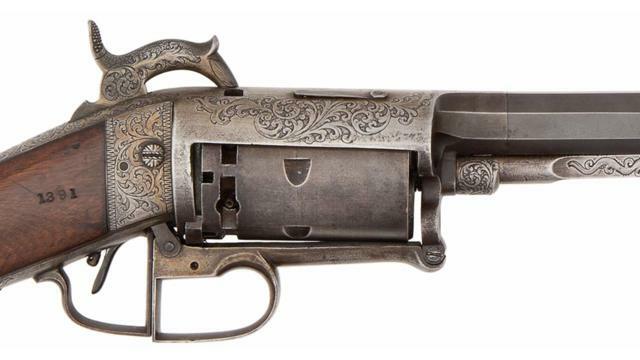 Alongside the firearms featured in this auction is a selection of Mr. Aziz's collection of U.S. Patent Office Models, representing the most pivotal developments in 19th century firearms development. This collection includes several iconic designs including the Sharps slide-action (Lot 169), Maynard cartridge retractor (Lot 280), and Hotchkiss Machine Gun (Lot 266) along with dozens of other important models.